Custom House Studios Gallery, The Quay, Westport, Co. Mayo. Opening on Thursday September 3rd at 7.30 pm. The exhibition runs until September 27th 2015. “our experience of any landscape through the senses is inseparable from the social and psychological context of the experience” (Sopher 1979). ‘Diverging Streams’ explores landscape and travel, an interest which was prompted by my recent move abroad. These works are based on photographs taken during my travels to Iceland, Scotland, England and Ireland. They attempt to convey the fleeting relationship which exists when we, as outsiders, pass through a new landscape. These landscapes are unique and serve as an identity of a place. My work attempts to capture this identity, while acknowledging that we all perceive these scenes through the lens of our own personal experiences. The viewer can place their own associations and narratives on a landscape, be it a memory, a story heard in childhood or the people with whom the experience of this scenery is shared. The characters of the woman and donkey draw on historical works such as “A Midsummer’s Night’s Dream”, folktales such as “Donkeyskin” and the story of the Nativity. All of these works tell the story of journeys, transformations and magic that alters the perception of a place. The works in this exhibition explore these themes through the use of watercolour, drawing and hand-built porcelain sculpture. 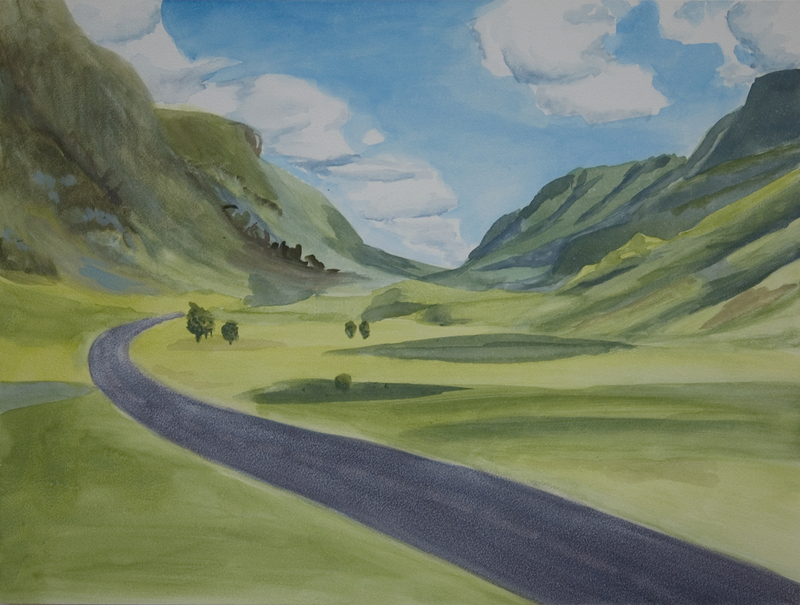 Image: Highlands, Watercolour on board, 30.5 x 40.6 cm.